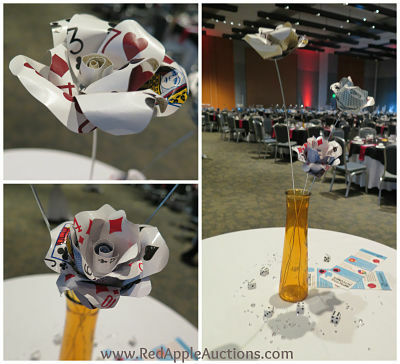 Auction centerpieces were made to resemble roses. They were created from the pages of comic books. In just a couple of days, flowers — especially roses — are going to be delivered to doorsteps and offices all over the USA, brightening the faces of many as they are honored by a beloved for Valentine’s Day. Fresh flowers are still a popular centerpiece choice for many auction galas, but if your budget can’t swing fresh, then let’s look at fake. Two of my clients figured out how to fill their tables with colorful flowers on the cheap. 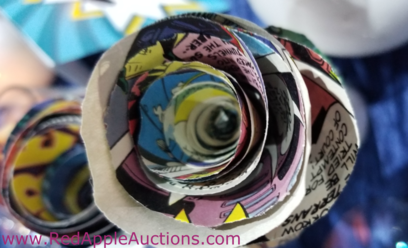 Close-up of a rose made from the pages of a comic book. Last fall I worked two auction fundraisers within a month of each other. Both used a similar concept. The centerpieces at each auction were made of flowers created from paper. One children’s charity has a cartoon for a logo. Comics and cartoons are also frequently used in their marketing. 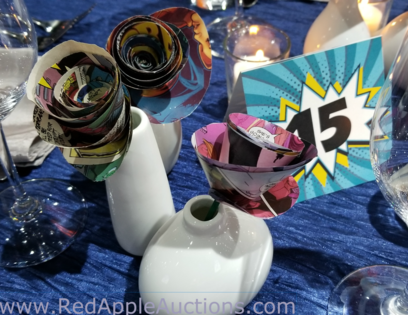 They opted for centerpieces made of comic book pages. The vivid colors found in comic books translated beautifully to create bright centerpieces against a sea of blue tablecloths. The other gala was for a Boys and Girls Club. The club had a 007 James Bond theme. To tie into the vibe, they created small bouquets of flowers made from decks of cards. I learned that one of the team members has a college degree in sculpture arts. It wasn’t difficult for her to whip out her glue gun and create some long-stemmed roses from a few decks of playing cards. At a Dr Suess-inspired event a few years ago, I’d seen something similar made from the pages of Dr. Suess books. If you’ve got some creative volunteers on your team, forming these flowers would be a good job for them. For other articles on auction centerpieces, you might be interested in these posts, too. Auction Centerpieces: Sell or give away?